THOSE of us who have spent much of the past few years complaining that Federal Reserve policy was too tight to nurture a strong economic recovery are grateful for Chicago Fed president Charles Evans. Mr Evans has made two invaluable contributions to monetary policy-making. He has made himself an open advocate for a more “dovish” policy regime: a departure of sorts within the Federal Open Market Committee, where the loudest voices are nearly always those calling for tighter policy. And he has pushed the committee toward a policy framework that represents a real advance for the central bank. Mr Evans was an early supporter of using numerical thresholds to shape communication about future interest rate decisions. He would swap out guidance suggesting rates would stay low for an extended period or until a calendar date for language relating future interest rate moves to rates of unemployment and inflation, making it much easier for markets to understand what economic conditions the Fed is trying to achieve. Perhaps more important, Mr Evans’ first pass at the thresholds was surprisingly inflation-tolerant. He reckoned the FOMC should leave rates low until unemployment fell below 7%, so long as inflation remained below 3%. A tolerance for higher inflation may be a critical ingredient in recovery from the sort of recession America faced in 2007-2009, in which deflationary pressures were significant and the Fed’s policy rate was stuck at the zero lower bound. It has been encouraging to watch other FOMC members come around to Mr Evans’ view, and to see Fed policy inch in his direction. But Mr Evans’ latest speech is a little disconcerting, because it seems to reflect a slightly more inflation-averse perspective. He seems to have moved toward the view of Chairman Ben Bernanke, that the Fed can immaculately boost real growth without any inflationary consequences (or, if you like, “side benefits”). With regard to the inflation safeguard, I have previously discussed how the 3 percent threshold is a symmetric and reasonable treatment of our 2 percent target. This is consistent with the usual fluctuations in inflation and the range of uncertainty over its forecasts. But I am aware that the 3 percent threshold makes many people anxious. He´s NOT aware, he was made aware! It´s not politically correct for the Fed to mention any rate higher than 2%, ever! That´s become an impregnable firewall. Soon he´ll be down to Kocherlakota´s 2.25%. Maybe that´s the acceptable threshold “margin of fluctuation”. Federal Reserve Chairman Ben Bernanke last week became the latest economist to ask why the current economic recovery has been so weak. The question has inspired a cottage industry of studies, papers and speeches with often-esoteric and murky theories. The explanation is actually straightforward: The financial crisis and Great Recession scared the wits out of most Americans — not just consumers but also corporate managers, bankers and small-business owners. They are reacting accordingly. They’re cautious, risk-averse and defensive. They’re spending less and saving more. The recovery’s languor is striking. Bernanke, speaking to the New York Economic Club, noted that the economy’s annual growth rate had averaged only about 2 percent since the recession officially ended in mid-2009. By contrast, the average growth rate of post-World War II recoveries at a similar stage is almost 4.5 percent. This means the economy is producing about $1.4 trillion less of everything, from Big Macs to cars, than it would if we’d had an average recovery. No one asks any more why the crash was so deep. The generally accepted reason being the blow-up of the housing bubble and the damage it inflicted on households and financial institutions. And the Fed is praised for not letting it reach ‘Great Depression’ status! Typically after a recession hits bottom, there’s a period of above-average growth. Excesses (too many houses or dot-com start-ups) are cured by fire sales or bankruptcies. Pent-up demand or government “stimulus” policies spur spending. Surviving businesses begin to hire to meet added sales. Confidence revives. Recoveries become self-sustaining. In today’s recovery, this recuperation has been partial. One theory is that recessions accompanied by a financial crisis are harsher and longer. To repay debts, borrowers reduce spending. Facing bad loans, lenders lend less or go bankrupt. 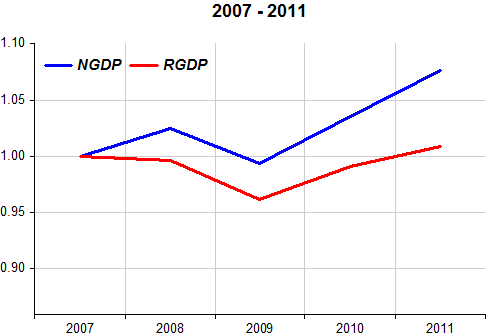 That has become the “great cop-out”, courtesy of Reinhart & Rogoff. But the real reason for both the hard fall and feeble recovery is depicted in the chart below (which Bernanke should put up on his office wall as a permanent reminder). Both the deep drop and feeble pick-up are associated with monetary policy, i.e. Fed errors. 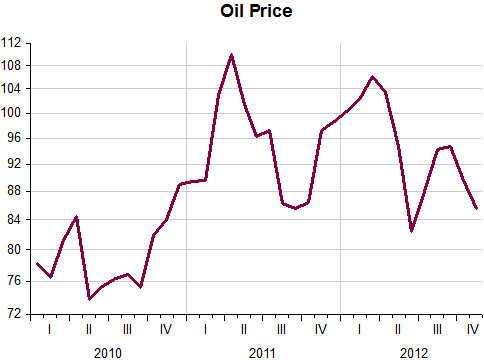 Behind the fall was the Fed´s unassailable concern with the possible inflationary effects of oil and commodity prices. Behind the weak recovery is the Fed´s 2% inflation target “firewall”. The point, then, is that the whole “credibility” argument is incoherent. Higher expected inflation down the road is not all higher budget deficits will do. In fact, it´s even unlikely it will help end the slump. Rogoff & Reinhart insist with their argument that the economy is performing as best as is possible following a financial crisis. What are some of the key lessons from the financial crisis and the recovery? Reinhart: The U.S. recovery very much fits the mold of those following any severe financial crisis. The U.S. did not have as sharp an initial decline in output as what you have seen in emerging markets or, in effect, as what you saw in prior crises in U.S. history.—not just the Great Depression, but in the crises of 1907 and 1893, as well. 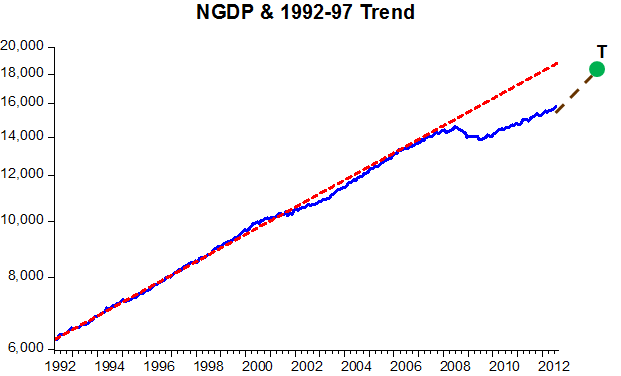 In all of these, there were years where you had massive initial declines in GDP [gross domestic product] of 10% or 12%. In the Depression, it was 30%. We did not have that this time. But all the other developments were the same, including the failure to regain what was lost in income and employment, and how long it has lasted. Post-war recessions, on average, barely last a year. And here we are having these conversations five years after the onset of the subprime crisis. It attests to the long duration of this type of systemic crisis. In the historical context, the U.S. has had, overall, a pretty good track record in the latest crisis. In terms of income per person and in comparison with other countries that are having similarly severe crises, we are doing pretty well–but not so hot in terms of unemployment. Rogoff: We have always argued that the right metric for thinking about deep financial crises is to compare the current conditions to where you started. It is a much more robust method, particularly because there are false starts, and you don’t know when the recovery starts. It is really getting into semantics to say, “Well, we are not racing ahead that fast.” But the flip side of that is that a lot of effort was made to have the economy not fall that fast. There is basically fiscal stimulus being taken out of the economy, for example, as we are consolidating from the initial $800 billion stimulus in 2009. And if we hadn’t done that, there would be more room to make the economy grow faster now. But that doesn’t mean we would be ahead. “We did not have that this time”. I certainly agree and would be surprised if more than one century later we would make the same mistake. But we did, only in much less intensity. 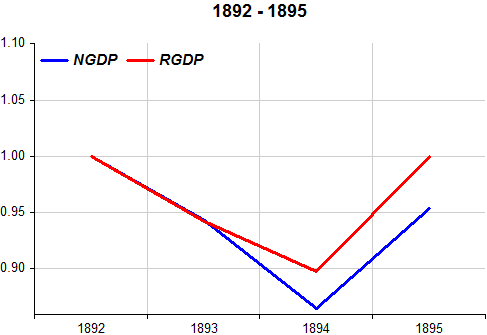 Nominal spending in 2009 didn´t drop 13.5% like in 1894 (relative to 1892) but only 3% (relative to 2008). This was a first since 1938. But in 2010 we could have been much more “aggressive” in getting spending up, as it was done in 1895. And isn´t it comforting to read Rogoff saying: “But the flip side of that is that a lot of effort was made to have the economy not fall that fast”. Yes, belatedly the monetary “breaks” were applied cushioning the fall, but what is lacking is the requisite monetary “acceleration” to get the economy back out of the “ravine”. The Charts below provide the illustration. And I´m willing to wager that if monetary policy remains on the “side lines” in 6 months time the DOW will not be higher than 13000! I “lost” that wager by about 100 points. But another three months on things have worsened again. 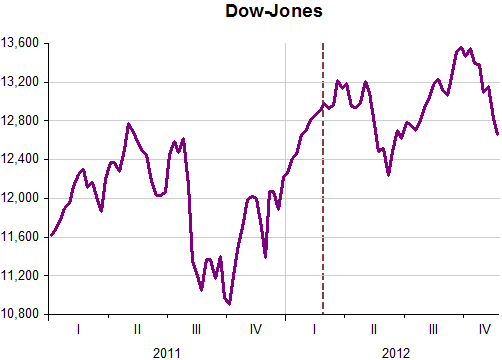 The Chart illustrates the Dow on a weekly frequency since January 2011 with the dotted bar denoting the day the post was written. Now I´m more cautious about a new “wager” because Nouriel “Doomsday” Roubini has said things are very likely to get worse! Fed officials are mulling over changes to how they communicate to the public where they expect interest rates to be in the future. Federal Reserve Vice Chairman Janet Yellen said last week she supported an approach backed by some other policymakers in which the Fed would state how high inflation would have to rise or how low unemployment would have to fall before it would move rates, which have been near zero since late 2008. “It’s possible to get to a threshold number for unemployment, as long as we present it as indicative of a broader evaluation,” Mr. Lockhart told reporters after a University of Virginia Investing Conference. Ms. Yellen also said that any specific levels wouldn’t lock the Fed into changing its policy, but rather would trigger a discussion about the proper policy. They could, or should, state an NGDP level target and just shoot for it. Much simpler way to get the message across (and to get employment up and unemployment down)! 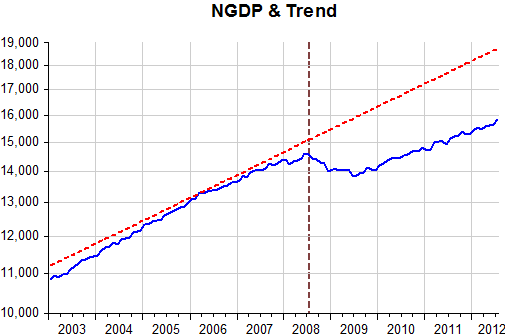 And once the target T level is attained, specify a target growth rate for nominal spending from that point on. There has been enough procrastination at the Fed. It has acted like those old British “gentlemen´s club” where everyone is so well-mannered that nothing really happens, and boredom prevails. Whether the rest of the FOMC follows suit with this approach is another question, but the winds are definitely blowing in that direction. On average then, this is relatively dovish. The Fed is heading toward a policy direction that would explicitly allow for inflation somewhat above target and unemployment below target as long as inflation expectations remained anchored. One would think this should put upward pressure on near term inflation. What should we make of this figure? 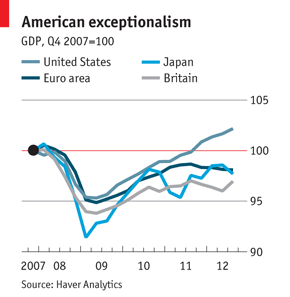 Some will see secular stagnation at work. Others will blame macroeconomic policy: the zero lower bound, perhaps, or insufficiently stimulative fiscal policy. Some might point out that all of these countries are trying, simultaneously, to raise their external surplus (or get one in the first place). Whatever the story, it is a remarkable state of affairs. 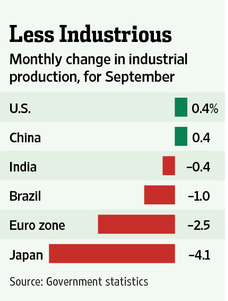 These economies account for over half of world output (for the moment, at least). That humming sound in the background comes from America’s busy factories. Unfortunately, one reason you can hear it so clearly is the relative quiet in most other parts of the world. Given that much of the strength in U.S. manufacturing has come from export-oriented sectors, it is hard for such a discrepancy to endure. Further complicating matters is the looming “fiscal cliff.” During the third-quarter earnings season, several companies mentioned both slow growth abroad and budgetary uncertainty at home as reasons they may restrain capital expenditures. 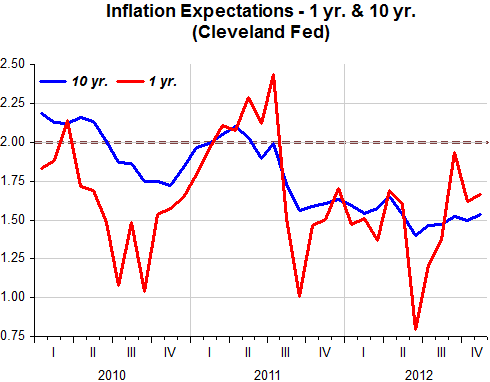 And today´s inflation release which is accompanied by the Cleveland Fed´s inflation expectations indicates that long run (10 year) inflation expectations has been “dormant” while short term (1 year) expectations has bumped along to the beat of oil prices. It seems that even if Bernanke leaves at the end of his term in 2014 “boredom” will continue to prevail. After all, “toes are sacred” and not to be stepped on! 5. But there’s something wrong with thinking that the Bank of Canada has any degrees of freedom in setting the overnight rate target. The Bank of Canada is targeting 2% inflation. If it is serious about trying to keep future inflation as close as possible to the 2% target, it cannot freely choose a target for the overnight rate. Once it has chosen the 2% inflation target, it has used up all its degrees of freedom. It has to do what (it thinks) it needs to do to hit that inflation target. If it sticks to the 2% target, any commitment becomes a conditional commitment. But then “I promise I will set the overnight rate at 1% unless I think I need to change it to keep future inflation at 2%” is no different from “I promise I will set the overnight rate at whatever I think is needed to keep future inflation at 2%, and I think 1% will work for some time”. It’s like making a “promise” to do whatever you think you will feel like doing. It’s not a promise at all. There is an implication that the notion (of fighting deflation risks) that we are restricted solely to overnight funds. But our history as an institution indicates that there have been innumerable occasions when we have moved out from short-term assets and invested in long term Treasuries. We do have the capability, if required to do so, to go well beyond activities related to short-term rates. But saying “what could be done” wasn´t enough. Unemployment kept rising, nominal spending growth didn´t get traction and real growth remained weak. The FF rate, which had be brought down to the unheard of level of 1.25% remained at that level all the way to June 2003. Encouraging investors to expect short rates to be lower in the future than they currently anticipate. Although the FF rate didn´t change, remaining at 1%, the new words, more recently labeled forward guidance, did the trick! 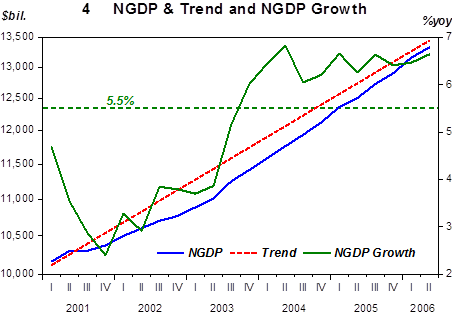 As can be observed in charts 4 & 6, spending growth and real output growth rose markedly and unemployment trended down. Other indicators of the markets appreciation of the stance of monetary policy reacted accordingly. In chart 7 we show the behavior of the stock market (S&P 500) and of the yield on the 10 year Treasury Bond. The “pessimistic” decline in those indicators prior to the Fed´s policy change was immediately reversed. The stock market, being more forward looking, reacted earlier. 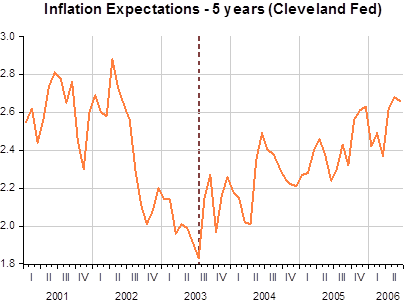 Chart 8 illustrates the behavior of 5 year expected inflation (from the Cleveland Fed). Any concern for an unwelcome additional fall in inflation was immediately forgotten! The “for a considerable period” language remained a feature of the statements following the next FOMC meetings in September, October and December 2003. Indicating that the moment that rates would start rising had been brought forward. The FOMC in effect was saying: Time´s up, but stay calm because the FF rate is not going to jump up! On cue, the rate was raised by 25 basis points (0.25 percentage points) in the June 2004 meeting and the words at a pace that is likely to be measured remained. And it was so all the way to Greenspan´s farewell FOMC meeting on January 31, 2006, when the FF rate was raised another 25 basis points to 4.5%. Why is present day forward guidance not having much impact, despite the promise to keep rates low “´till hell freezes over”? Maybe that has to do with the fact that as of January 2012 the Fed became a de facto inflation targeter! With the President reelected and the House and Senate largely unchanged in composition, the first thought that came to my mind was the classic Sartre play No Exit, with President Obama, Speaker Boehner, and Majority Leader Reid playing the three characters. Will it be a repeat of the last two years when any policy initiative was “blocked” and even the Fed was “coerced”? Is that what voters want, or do they think that absent a short term prize (the Presidency) on the horizon, things will progress differently? The auto industry could see a boost from consumers who delayed purchases or need to replace vehicles once life returns to normal for those affected by Hurricane Sandy, according to a recent report from car-shopping website Edmunds.com. Edmunds Chief Economist Lacey Plache noted that there were about a half-million damaged vehicles during Hurricane Katrina in 2005, which affected a much less populated area than New York and New Jersey which were hit by Hurricane Sandy. “Sandy’s impact may well be higher, but even if 100,000 damaged vehicles are replaced by the end of the year it could boost auto sales three to four percent for the quarter, and that has a positive effect on the economy overall,” Dr. Plache said. What Mr. Lacey Plache left unsaid is that deep down he prays for Sandy´s “sisters” to pay a visit every couple of years. Why wait for seven long ones?